Scum collecting and removal facilities, including baffling are desirable ahead of the outlet weirs on all settling tanks. Horizontal spraying with water under pressure may be employed to collect the scum for hand removal, if no mechanical skimmers are installed. FIG. 7.16.3 Manual scum removal with rotating radial arm skimmer. merged slightly below the waste surface. The scum, mixed with waste, flows into it and is discharged through the pipe to a scum pit located outside the tank. If the scum is to be removed mechanically, cross collectors consisting of endless chains above the surface are used. These carry flights which move the scum into the scum-trough, or in case of the helicoid spiral skimmer, the collector slowly turns and sweeps (with its rubber blades) the scum over the curving back edge of the tank into the scum-trough. The circular scum baffle is installed ahead of the circular effluent weir-trough and is submerged to a depth of at least 18 in. 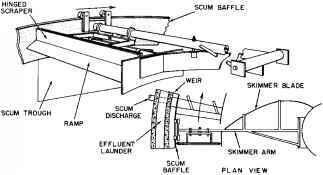 Scum removal in circular tanks is usually performed by a radial arm skimmer, which is attached to and rotates with the sludge-removal equipment (see Figure 7.16.3). A skimmer blade moves the scum to the periphery, and hinged scraper blades or neoprene wipers sweep the scum up on a ramp and into a scum-trough. Some tanks are also equipped with automatic flushing devices. Air skimmers may be used to serve small treatment plants. They work on the same principle as airlifts. The only difference is that the suction end of the airlift pipe is turned up by 180°, terminating slightly below the tank's water level. 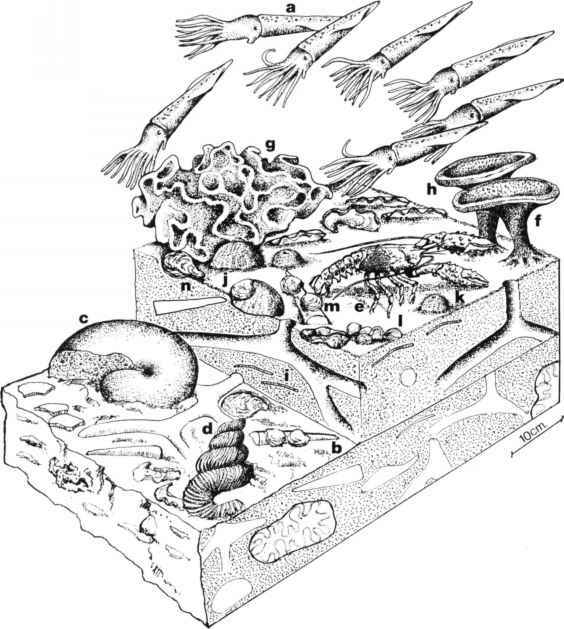 It is provided with a funnel-type extension to collect the scum. The scum is generally collected in a separate scum sump, which can be provided with dewatering facilities. The scum is usually combined with the primary sludge and is disposed of by 1) digestion, yielding gas with high fuel value; 2) by vacuum filtration or incineration; and 3) by burial. The volume of scum in normal domestic waste may range from 0.1 to 6 ft3 per mg (0.75 to 45 liters per 100 m3), or 200 ft3 (5.75 m3) per 1000 capita per year.